Make installations easier and less labor intensive. 16 SEER/13 EER ratings up to 4.5 tons with the N(R)8MXL00702118A. 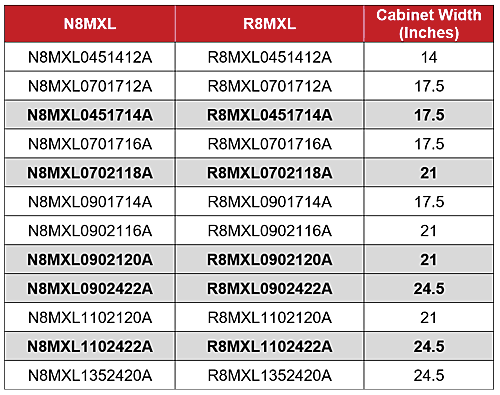 Variety of cabinet widths including: 14", 17.5", 21", and 24.5"
New models are highlighted in gray. 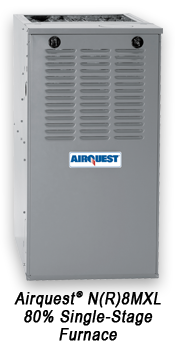 These new flush-mount N8MXL and R8MXL furnaces could be the ideal solution for installations with low heating but high cooling loads. Contact your distributor to order your N8XML or R8MXL today! 1Timely registration required for five-year parts limited warranty. Jurisdictions where warranty benefits cannot be conditioned on registration will receive the registered limited warranty periods. Please see warranty certificate for further details and restrictions.